Our wide selection of Halloween yard art includes pumpkins, ghosts, witches, bats and many more. Browse through our collection of wooden Halloween yard art and find exactly what you're looking for this Fall's decorating. 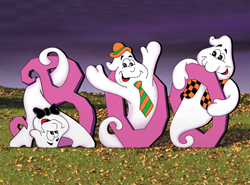 Our collection of Halloween Yard Art includes many fun characters and scenes for making the season exciting and fun. We offer detailed do-it-yourself instructions to make the project easy from start to finish. With a wide variety of designs, we are sure that you will find the perfect do-it-yourself Yard Art to fit your needs.